Pictured here is a painted example of a 2-1B hardcopy. Obviously, the piece is lacking its arms, which isn't too surprising given the fragility of the urethane material and the thinness of the arms of this particular figure. It is particularly pleasing to see a fully-painted example (such painted hardcopies are often referred to as "paint masters") of a pre-ROTJ hardcopy. The piece is also interesting for the type of urethane used to cast it: as is evident from a look at the bottom of the figure's feet, it is comprised of a tan-colored material. This tan urethane, known as "Carbalon," seems to have been the standard for Kenner hardcopies prior to about 1982, after which the company seems to have employed the green "Dynacast" for most of its hardcopies. I also love the paint job of the figure--the solid silver of the mid-torso portion is a visually-interesting alternative to the clear plastic that was used on the production piece. The figure is pictured alongside an extra leg, which, for some reason, shows indications of some red coloration on its base. Its worthwhile here to point out what is one of the hardcopy's defining features: the lack of holes on the bottoms of their feet. Here we have a series of 2-1B figures, which Mike has been very fortunate to assemble. 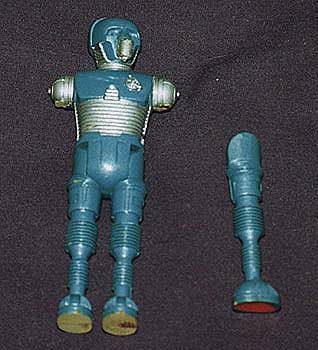 Pictured, from left to right, are the painted 2-1B hardcopy and spare leg, an unpainted 2-1B production figure, the standard vintage production figure, an oddly-colored example of the POTF2 version of the character, and a standard POTF2 2-1B. Assembling such a series can be very challenging for a collector, as well as satisfying once he has the chance to see them laying beside one another as these are pictured here.